Brown patches in conifers can be caused by a number of reasons. Pests or diseases are responsible for some cases, but others may be caused by growing conditions or routine operations such as trimming. Brown patches can develop anywhere within the hedge, varying in size from 1-2cm (½-1in) to 3-4m (10-14ft). Patches develop most commonly in the summer, when the trees are in active growth. Brown patches can appear on any conifers, but most problems are with × Cuprocyparis (formerly Cupressocyparis) leylandii (leyland cypress), Chamaecyparis lawsoniana (lawson cypress) and Thuja plicata (western red cedar). Cypress aphid (Cinara cupressivora) is a relatively common cause of brown patches. A collaborative research project between the RHS and East Malling Research found cypress aphid to be associated with half of the cases of brown patches investigated. Damage caused by cypress aphid develops in late spring and summer. It is found most often at the base of the hedge, but can develop at any height. Large greyish greenfly are sometimes found, but the browning often develops long after the aphids have left the foliage. Clues are sometimes left behind, including cast aphid skins and a black fungal growth (sooty mould) that grows on the sugary honeydew excreted by the pest. There are a number of aphid pests of other conifers. Scale insects, usually juniper scale, are found quite commonly in affected areas. These, like the cypress aphid, feed by sucking the sap from the foliage. Heavy infestations of juniper scale are thought to cause some dieback, but this scale insect is common and is often incidental to the problem. If there are similar numbers of scale insects on parts of the hedge unaffected by the dieback then this pest is unlikely to be the primary cause of the problem. A fungus called Pestalotiopsis is occasionally associated with brown patches, and can be seen as tiny, black fruiting bodies scattered over the affected foliage. This fungus usually attacks weakened or damaged plants, but once present it can sometimes cause quite severe die-back. Pestalotiopsis is more likely to be a problem in wet summers. This disease is caused by the fungus Seiridium cardinale, and can cause branch die-back of leyland cypress and western red cedar. It is found most commonly on large trees, and is relatively rare in smaller hedges. If the browning affects most or all of the foliage of an individual tree in the hedge, or a tree dies completely, a root disease such as honey fungus or Phytophthora root rot could be responsible. All conifers have little or no capacity to regrow from old wood. Over-enthusiastic hedge trimming can result in bare patches. The time of year when trimming is done is also important, even if it is just light trimming. The research project outlined above found that die-back appeared to be slightly more common after autumn trimming (mainly October). Trimming in the summer during times of plant stress, such as prolonged drought or hot, dry spells may also be a factor. 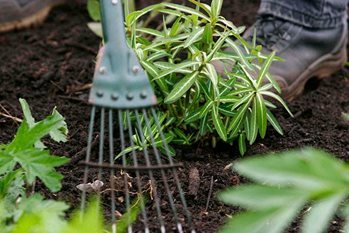 RHS Gardening Advice believes that many brown patches are likely to result from adverse growing conditions such as drought, frost, waterlogging or cold, drying winds, all of which could inhibit regeneration from the trimmed foliage. If the browning affects most of the foliage of individual trees, check for root diseases, waterlogging or establishment failure. Avoid trimming during hot or dry weather or in the autumn (yew can be pruned into early autumn), and never cut into old wood. Trimming two or three times, in April, June and early August, is usually relatively safe. Removal of competing vegetation within 30cm (1ft) each side of the hedge, feeding the trees with a general fertiliser in late winter and mulching the base of the hedge with a 8cm (3in) layer of well-rotted organic matter should also help. Bare patches may (depending on the cause) gradually fill in, but in serious cases this can take several years. It may be possible to tie in nearby healthy shoots to fill bare areas if these are not too extensive. If conifer aphid is the cause of the problem then spraying with an insecticide such as Bug Clear Ultra may help, but this will need to be applied as soon as the aphids or the first signs of damage are seen.